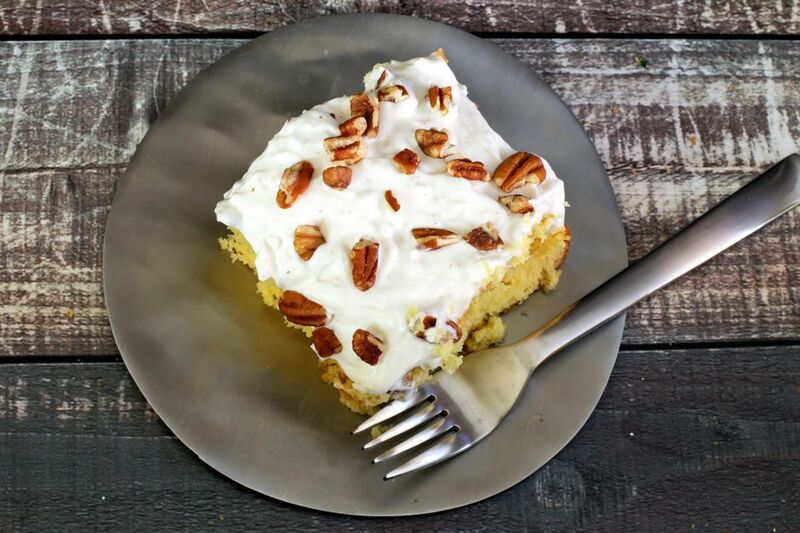 This pina colada cake recipe is a rich, sweet, delicious cake made with pineapple and coconut. A filling of coconut cream and sweetened condensed milk are poured over the baked cake, from a yellow cake mix, and then crushed pineapple is spread over the top. The topping is a mixture of whipped topping and shredded coconut. Thanks to Janet for sharing this easy tropical cake! Bake cake according to the mix's directions in a 9x13-inch baking pan. While the cake is baking, mix the coconut milk and condensed milk together well. When the cake is done, take the handle end of a wooden spoon and poke holes all over the cake. Pour the coconut and condensed milk mixture into the holes and over top of the cake. Place a sieve over a bowl and drain the pineapple thoroughly. Spread the drained crushed pineapple on top of the cake along with some of the reserved liquid. Let the cake cool and then mix the coconut, and whipped topping together and spread on top of cake; sprinkle with chopped pecans. Replace the frozen-thawed whipped topping with 2 envelopes of Dream Whip prepared following the package directions.